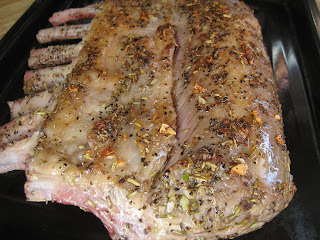 Broiled Lamb Rack... 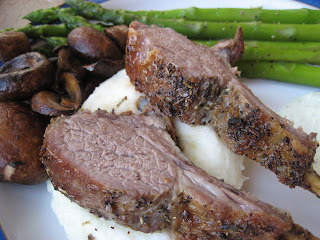 This has got to be one of our favorite special occasion meals in our home. We often have this meal for birthdays, anniversaries, Christmas and any other day we feel like it. This was one of those days... we were actually reminiscing about our Christmas dinner in London. We had some great rack of lamb from the Borough Market, delicious and full of flavor,...but in this case, our rack of lamb came from Costco! Needless to say, it sufficed our cravings and was just as delicious. I like keeping this recipe simple....just a few ingredients. It comes together very quickly... We like to serve it with creamy mashed potatoes, asparagus and sometimes mushrooms. You can fancy it up a bit by serving it with some mint jelly and a pan sauce. In a small bowl, place salt, pepper, rosemary, chopped mint. Mix the seasoning. 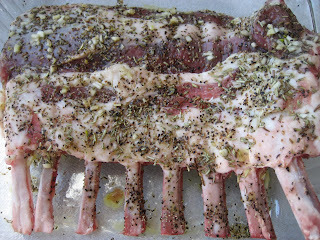 Rub the lamb of rack with a drizzle or two of olive oil. Add the seasoning all over. 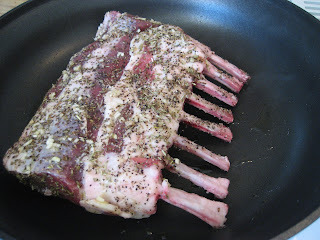 In a skillet sear the lamb of rack turning every so often so as not to burn. Sear for 2-3 minutes. Place rack in a shallow oven dish (or if you have a oven proof skillet) . Bake in a preheated 425-450 oven for 15- 20 minutes or until desired doneness.